Whistler - Blog from Whistler, British Columbia | Dreaming of a White Christmas! It was a long drive from Blue River to Whistler - about 6.5hrs - but we came through some spectacular mountain scenery.we went up and down mountains, through rain, fog and sun. The first part of the drive was typical BC scenery - mountains covered in pine trees and yellow trembling aspens and rivers and lakes. It was very beautiful. Then we came to farming areas. There were cows and sheep and very green paddocks. We passed some very tiny towns and some a bit bigger. One mountain we climbed took us over 1000m up. About 3.5hrs in the mountains changed and became huge mounds of rock and dirt with the occasional tree growing in it. We wondered whether they were the result if glaciers retreating hundreds of years ago. We passed a farm where heaps of Lamborghinis were parked out the front. Within 30-40mins they were behind us. By now we were on a very windy, very steep mountain road. 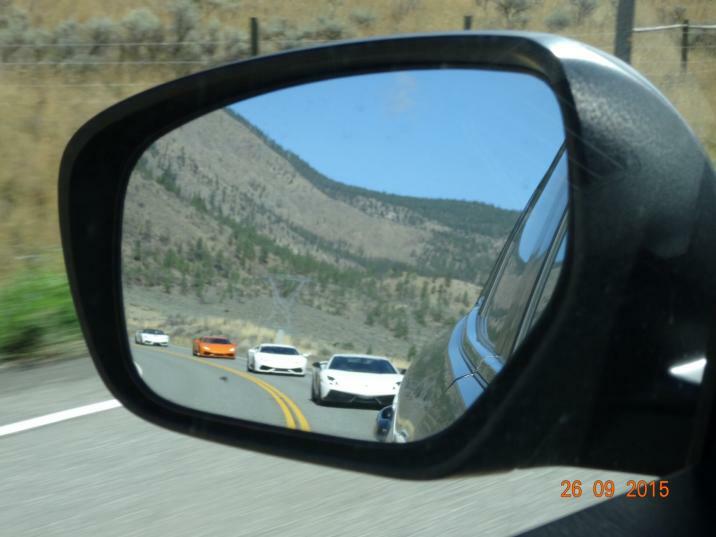 As soon as they had a chance, they would pass us, sometimes 4 at a time. The road was probably like a racing track to these drivers. They looked pretty cool all lined up on the road. We continued on this steep road around a gorge and town to a town called Lillooet. This town has a huge indigenous population - over 50%. It was a gold rush town in times gone by. We stopped here for a late lunch and let the Lamborghinis go. The steep, windy mountain road continued a long way after Lillooet. The road took a lot of concentrating but the scenery was stunning. We arrived in Whistler sometime after 4pm. Our hotel is perfectly located - we walk out onto the main pedestrian area where everything is. Jane, you are a legend for getting us this room. We have a kitchen, lounge room with a log fire you turn on and off by pressing a button and a full sized bathroom. You have never seen 2 women so excited by opening a cupboard door to discover we have our own washing machine & dryer!!!! We went to the visitors centre and bought tickets to do the Peak to Peak gondola tomorrow and a bear viewing your on Monday evening. Afterwards we walked through the plaza to where the gondolas and chairlifts go up Blackcomb and Whistler mountains. There were a huge amount of people around. The Mudderella had been on today so there were heaps of women of all ages looking muddy and cold. The bars were full and some had queues to get in. Luckily we had had a late lunch because I don't think we were going to get in anywhere for dinner. We went to the supermarket to get breakfast supplies. We saw lamingtons, Tim Tams and Vegemite scrolls. There must be a big Aussie population here. There is a lot of partying going on tonight. We can here cheering and talking outside. There is also plenty of noisy people in the hotel here. Maybe they will all be heading home tomorrow. Although the sun was shining when we were out earlier, it was still pretty cold. Tomorrow is going to be sunny and 20 degrees but our Jasper experience tells us it still will be cold up on the mountains. I am looking forward to our study here. It looks beautiful.